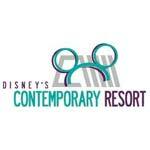 Disney's Contemporary Resort is an ultra modern Disney Deluxe Resort, made up of a towering A frame high rise building the iconic Contemporary Tower and complemented by one garden wing annex. This lakeside Resort is the only hotel in Walt Disney World Resort to have the Walt Disney World Monorail System pass through the main lobby. Boasting views of nearby Space Mountain attraction and Cinderella Castle, the Resort overlooks 4.5 miles of shoreline along Bay Lake and Seven Seas Lagoon and is the closest hotel to Magic Kingdom theme park. At the hotel's award winning California Grill restaurant on the 15th floor, dine in comfort as you behold nightly fireworks from the park. 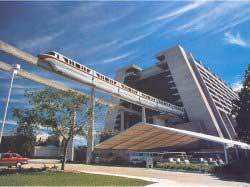 You can also pick up the monorail on the fourth floor to easily make your way to Magic Kingdom theme park and Epcot theme park.